Mexico City plans to draw drinking water from a mile-deep aquifer, according to a report in the Los Angeles Times. The Mexican effort challenges a key tenet of U.S. clean water policy: that water far underground can be intentionally polluted because it will never be used. U.S. environmental regulators have long assumed that reservoirs located thousands of feet underground will be too expensive to tap. So even as population increases, temperatures rise, and traditional water supplies dry up, American scientists and policy-makers often exempt these deep aquifers from clean water protections and allow energy and mining companies to inject pollutants directly into them. 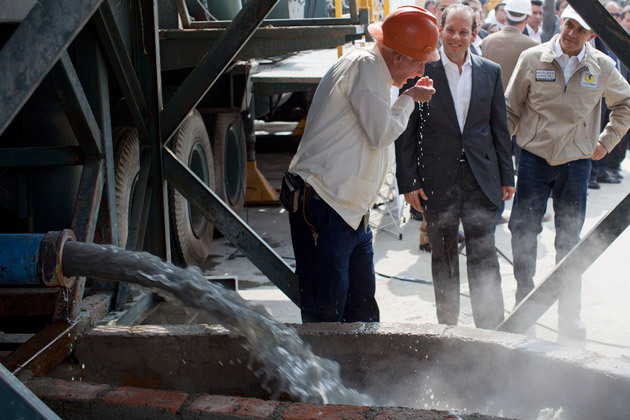 Mexico City’s mayor and general director of the country’s National Water Commission watch as a geologist takes a drink of water from an exploratory well into an aquifer underneath Mexico City, on Jan. 23, 2013. As ProPublica has reported in an ongoing investigation about America’s management of its underground water, the U.S. Environmental Protection Agency has issued more than 1,500 permits for companies to pollute such aquifers in some of the driest regions. Frequently, the reason was that the water lies too deep to be worth protecting. But Mexico City’s plans to tap its newly discovered aquifer suggest that America is poisoning wells it might need in the future. Indeed, by the standard often applied in the U.S., American regulators could have allowed companies to pump pollutants into the aquifer beneath Mexico City. For example, in eastern Wyoming, an analysis showed that it would cost half a million dollars to construct a water well into deep, but high-quality aquifer reserves. That, plus an untested assumption that all the deep layers below it could only contain poor-quality water, led regulators to allow a uranium mine to inject more than 200,000 gallons of toxic and radioactive waste every day into the underground reservoirs. But south of the border, worsening water shortages have forced authorities to look ever deeper for drinking water. Today in Mexico City, the world’s third-largest metropolis, the depletion of shallow reservoirs is causing the ground to sink in, iconic buildings to teeter, and underground infrastructure to crumble. The discovery of the previously unmapped deep reservoir could mean that water won’t have to be rationed or piped into Mexico City from hundreds of miles away. According to the Times report, Mexican authorities have already drilled an exploratory well into the aquifer and are working to determine the exact size of the reservoir. They are prepared to spend as much as $40 million to pump and treat the deeper water, which they say could supply some of Mexico City’s 20 million people for as long as a century. Scientists point to what’s happening in Mexico City as a harbinger of a world in which people will pay more and dig deeper to tap reserves of the one natural resource human beings simply cannot survive without. “Around the world people are increasingly doing things that 50 years ago nobody would have said they’d do,” said Mike Wireman, a hydrogeologist with the EPA who also works with the World Bank on global water supply issues. Wireman points to new research in Europe finding water reservoirs several miles beneath the surface — far deeper than even the aquifer beneath Mexico City — and says U.S. policy has been slow to adapt to this new understanding. “Depth in and of itself does not guarantee anything — it does not guarantee you won’t use it in the future, and it does not guarantee that that it is not” a source of drinking water, he said. If Mexico City’s search for water seems extreme, it is not unusual. In aquifers Denver relies on, drinking water levels have dropped more than 300 feet. Texas rationed some water use last summer in the midst of a record-breaking drought. And Nevada — realizing that the water levels in one of the nation’s largest reservoirs may soon drop below the intake pipes — is building a drain hole to sap every last drop from the bottom. In a parched world, Mexico City is sending a message: Deep, unknown potential sources of drinking water matter, and the U.S. pollutes them at its peril.